Happy 800th Anniversary Magna Carta! 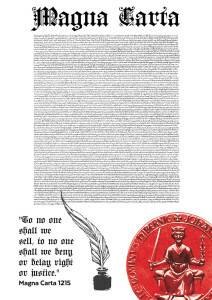 Today is the 800th Anniversary of the Magna Carta! Magna Carta Committee member Malcolm Stewart appeared on ABC News 24 and on ABC 702 to discuss the Magna Carta. The anniversary will be marked by a Magna Carta themed episode of Q&A on ABC1 at 9.30pm AEST. It will feature Magna Carta Committee Member Bret Walker SC and Parliamentary Patron, Speaker of the House of Representatives, the Hon Bronwyn Bishop MP, a celebration event run by the Centre for Independent Studies, a Ceremonial Sitting of the ACT Supreme Court, and a lecture on Human Rights and the Magna Carta at the Australian National University. The ABC Radio National website allows you to submit your own clause for a #newmagnacarta. 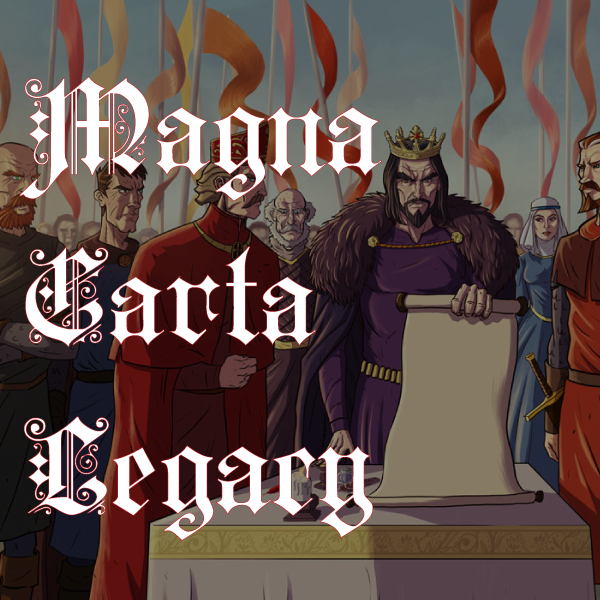 Don’t forget to check out our education site Magna Carta Legacy. Take the quiz to see how much you really know about the Magna Carta. Didn’t get the questions right? Try an easier quiz. The Magna Carta Committee has organised events and collaborated with groups from around the nation. The Australian Senate began the Magna Carta celebrations as they gave the Magna Carta a special mention in February. The Clerk of the Senate, Rosemary Laing, alongside Chairman of the Magna Carta Committee Nicholas Cowdery AM QC then spoke at a Magna Carta Symposium at the State Library of NSW in May, along with other fine minds on the subject of Australia and the Magna Carta. The sinister figure of King John casts his shadow in the public hall at the High Court of Australia. Our exhibition Magna Carta: To None Will We Deny Justice, for school students opened at the High Court of Australia. 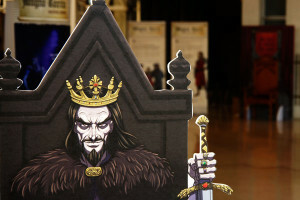 Coinciding with the launch of the exhibition was the launch of the accompanying website – magnacartalegacy.org which is supported generously by a grant from the Magna Carta 800th Committee in the United Kingdom. The start of June saw heightened discussion of the Magna Carta and its impact on society. Malcolm Stewart, a member of the Magna Carta Committee appeared on ABC 702 Sydney to discuss the Magna Carta on Wednesday (listen to the audio). The University of Sydney and the Rule of Law Institute ran a panel discussion on Australian Anti-Terrorism Laws and the Magna Carta, Bret Walker SC, a Magna Carta Committee Member, was a guest speaker – along with Dr Emily Crawford and Professor Colin Wight. Timebase and Lawyers Weekly covered the discussion. The June edition of the Law Society Journal featured Magna Carta: 800 Years Young, a paper by Nicholas Cowdery AM QC, and an article on the Symposium held earlier in the year. The Ceremonial Sitting of the ACT Supreme Court will include a Magna Carta Cake, or ‘Magna Cake’ for short. The celebrations, like the Magna Carta itself, live on after the anniversary on June 15. A Magna Cake – Perfect for any Magna Carta related celebration. The Tasmanian Parliament is holding a celebratory event on the 16th June at Parliament House in Hobart. The National Access to Justice and Pro Bono Conference on the 18-19th of June has a Magna Carta theme to mark the occasion. Nicholas Cowdery AM QC is presenting at the conference. The Judicial Independence in Australia Conference at the University of Queensland is sponsored by the Rule of Law Institute and is also celebrating the legacy and impact of the Magna Carta. British Library, ‘Four surviving Magna Carta to be brought together for the first time in history‘, 16/06/2013. UK Parliament, ‘Magna Carta and the Emergence of Parliament‘, 09/06/2014. US National Archives, ‘Magna Carta Conservation Treatment‘, 20/06/2011. BBC Radio 4, ‘The Magna Carta‘, In Our Time Podcast, 07/05/2009. The British Council, ‘Magna Carta – The Story of Man’s Fight for Liberty‘, 1946. Dr Graham Smith, ‘The Use and Misuse of Magna Carta‘, Egham Museum, 28/02/2014. 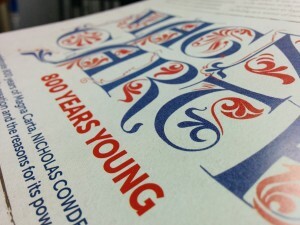 Barry York, ‘Magna Carta – the eight hundredth anniversary draws nearer‘, Museum of Australian Democracy Blog, 14/06/2013. Barry York, ‘How did the Magna Carta survive and is it relevant today?‘, Online Opinion, 18/09/2014. Professor Nigel Saul, ‘Magna Carta: is it relevant today?‘, Royal Holloway University of London, 23/01/2013. David Clark, ‘A confederacy of dunces: Magna Carta in History 8 textbooks‘, Online Opinion, 18/02/2014. Z T Sampson, Chief Justice Roberts praises Magna Carta, The Boston Globe, 11/08/2014. A Barnett, It’s time for a new Magna Carta, The Guardian, 14/06/2014. Australian Parliament House – The Senate, Australia’s 1297 Version of the Magna Carta. The Hon Sir Gerard Brennan AC KBE, An address on the Occasion of the Naming of Magna Carta Place, Langton Cresecent, Canberra. Lord Irvine of Lairg, The Spirit of Magna Carta Continues to Resonate in Modern Law. P A Keane, The idea of the professional judge: the challenges of communication. David Clark, The Status and Role of The Magna Carta in Australia and New Zealand, Melbourne University Law Review. A C Castles, The Reception and Status of English Law in Australia, Adelaide Law Review (1963) via Austlii. Michael Blakeney, ‘The Reception of the Magna Carta in New South Wales’, Journal of the Royal Australian Historical Society, September 1979. Cambridge has made three papers from the Cambridge History Journals available. Benjamin Franklin, The Examination of Doctor Franklin, before an August Assembly, relating to the Repeal of the Stamp-Act, Great Britain, Parliament, House of Commons, Boston: reprinted by Edes and Gill, 1766. H. D. Hazeltine, M.A., The Influence of the Magna Carta on American Constitutional Development, Litt.D.Magna Carta Commemoration Essays, edited by Henry Elliot Malden, M.A. with a Preface by the Rt. Hon. Viscount Bryce, O.M., Etc. For the Royal Historical Society, 1917. Justice John Bryson, Law and Politics of Magna Carta, Plantagenet Society of Australia, 18/09/2004 (see page 100). Magna carta commemoration essays, with a preface by the Rt. Hon. Viscount Bryce, ed. by Henry Elliot Malden, Royal Historical Society (Great Britain), 1917.